Omega Centauri is one of the finest jewels of the southern hemisphere night sky, as ESO's latest stunning image beautifully illustrates. Containing millions of stars, this globular cluster is located roughly 17 000 light-years from Earth in the constellation of Centaurus. Sparkling away at magnitude 3.7 and appearing nearly as large as the full moon on the southern night sky, Omega Centauri is visible with the unaided eye from a clear, dark observing site. Even through a modest amateur telescope, the cluster is revealed as an incredible, densely packed sphere of glittering stars. But astronomers need to use the full power of professional telescopes to uncover the amazing secrets of this beautiful globular cluster. This new image is based on data collected with the Wide Field Imager (WFI), mounted on the 2.2-metre diameter Max-Planck/ESO telescope, located at ESO's La Silla observatory, high up in the arid mountains of the southern Atacama Desert in Chile. 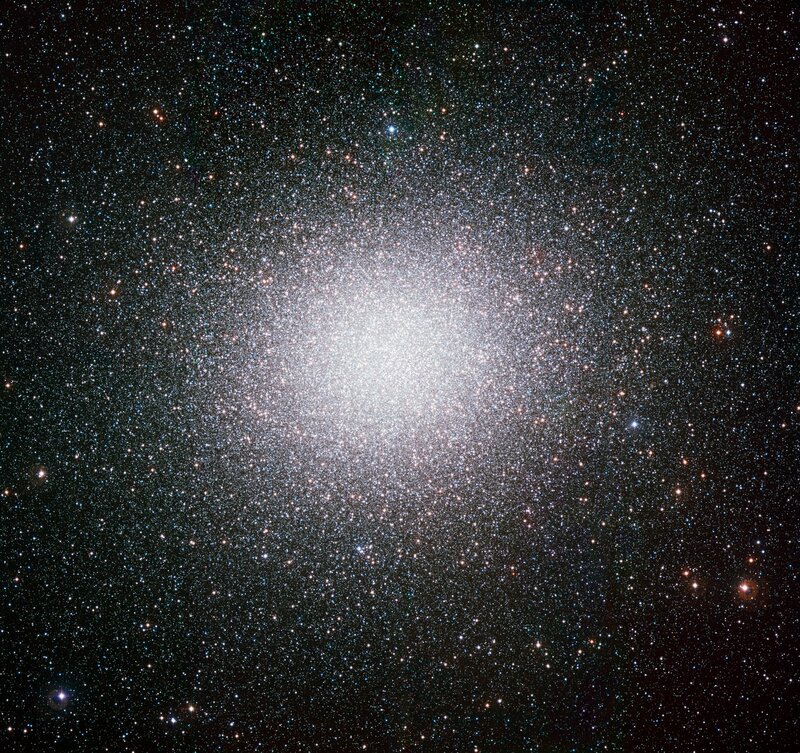 Omega Centauri is about 150 light-years across and is the most massive of all the Milky Way's globular clusters. It is thought to contain some ten million stars! Omega Centauri has been observed throughout history. Both the great astronomer Ptolemy and later Johann Bayer catalogued the cluster as a star. It was not until much later, in the early 19th century, that an Englishman, the astronomer John Frederick William Herschel (son of the discoverer of Uranus), realised that Omega Centauri was in fact a globular cluster. Globular clusters are some of the oldest groupings of stars to be found in the halos that surround galaxies like our own Milky Way. 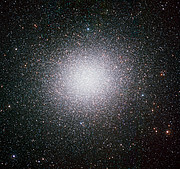 Omega Centauri itself is thought to be around 12 billion years old. Recent research into this intriguing celestial giant suggests that there is a medium sized black hole sitting at its centre. Observations made with the Hubble Space Telescope (see heic0809) and the Gemini Observatory showed that stars at the cluster's centre were moving around at an unusual rate — the cause, astronomers concluded, was the gravitational effect of a massive black hole with a mass of roughly 40 000 times that of the Sun. The presence of this black hole is just one of the reasons why some astronomers suspect Omega Centauri to be an imposter. Some believe that it is in fact the heart of a dwarf galaxy that was largely destroyed in an encounter with the Milky Way. Other evidence (see ESO Press Release eso0509 and heic0708) points to the several generations of stars present in the cluster — something unexpected in a typical globular cluster, which is thought to contain only stars formed at one time. Whatever the truth, this dazzling celestial object provides professional and amateur astronomers alike with an incredible view on clear dark nights.